On 28 November 2018, V.O. Chidambaranar Port, for the first time in Port’s history handled a vessel with parcel size of 82,170 MT. The vessel ‘MV BOTTIGLIERI GIORGIO AVINO’ with a draft of 14 metres was docked at the Berth-9 at 15.36 Hrs. 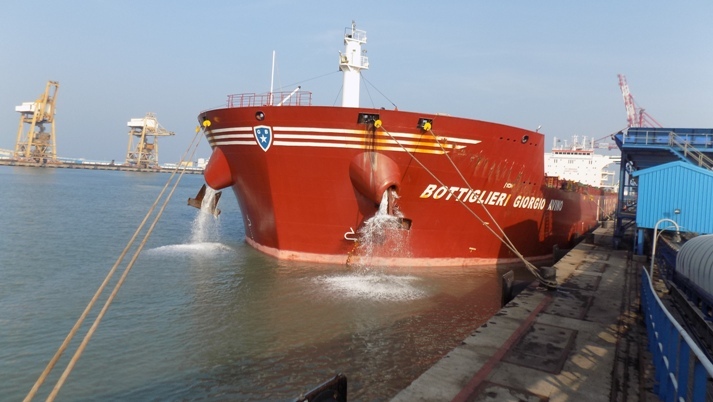 The Italian flagged vessel ‘MV BOTTIGLIERI GIOGIO AVINO’’ with 93,275 DWT, Length of 229.2metres and beam of 38metres arrived from the Port of Mina Saqr, United Arab Emirates with limestone, destined for Eastern Bulk Trading, Chennai, India Cements, Thalaiyuthu and Naga Limited, Dindigul. The Agents and Stevedores for the vessel is Seaport Logistics Pvt Ltd. Tuticorin. Earlier, the Port had handled 77,000 MT parcel size vessed coal MV Yannis Gorgias on 02 November 2018.Capt J. Kingston Neel Durai, Pilot under the guidance of Capt. Bhabatosh Chand, Deputy Conservator effectively guided the ship safely to the berth. Shri N.Vaiyapuri Deputy Chairman, V.O. Chidambaranar Port thanked the entire team which brought the vessel with parcel size of 82,170 MT to the Port and stated that, ‘the Port is promptly addressing the needs of its customers and with the recently executed Maintenance dredging and developmental projects on the horizon, this record-parcel size vessel calling the Port will be a game changer to the Port to handle more cargo and the trade to reap the benefit of ‘Economy of Scale’ in handling Coal, Lime Stone, Rock Phosphate and other Bulk cargo’.